I have been in the tourism industry for 49 years, with large experience in hotels and restaurants. I also have a great deal of experience in the airline business. Marketing Director, Costa Rica Tourist Board; Advertising and Sales Promotion Manager; LACSA, the airline of Costa Rica; Country Manager: United Airlines Costa Rica and Guatemala; General Manager; Aurola Holiday Hotel, Costa Rica; Operations Manager; Surfair Hotel, Gold Coast, Queensland, Australia. 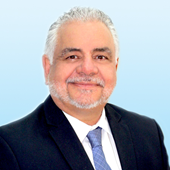 In addition, I am also Head of the Hotel Administration carrier at the Tourism University of Costa Rica. Land Marketing, Land Sales, Location Advisory and Incentives, Planning, Project Marketing, Property and Facilities Management, Public Relations, Hotels Consulting, Tourism Consulting. Blue Diamond Hotels; Kalia Living; Saúl Bistro Restaurants; White House Hotel; Cuna del Angel Hotel and Farm Hotel Altagracia, among others. MBA in Administration with emphasis in Marketing by the National University of San Diego, California. Bachelor's Degree in Political Science by University of Costa Rica. Marketing and Advertising by BBDO Training Center, Arrowood, N.Y.